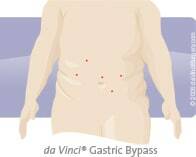 da Vinci® Robot-Assisted Gastric Bypass: the gold standard in minimally-invasive bariatric surgery. While da Vinci® Robot-Assisted Gastric Bypass is not right for everyone, it is an option for many candidates for weight loss surgery. Robot-assisted procedures are faster and have a lower risk of complications. The da Vinci® Robot also gives your surgeon superior maneuverability and vision of the surgical field. Dr. Jonathan Aranow discusses weight loss surgery using the daVinci® Surgical System. da Vinci® Robot-Assisted Gastric Bypass is a technologically advanced method for performing the gastric bypass process, which involves dividing the stomach to create a small pouch. The size of the pouch limits food intake to help you lose weight.